26. Ryze: The machine-gun mage of the mid lane, Ryze operates on a different range of power than most others. He relies on his massive mana pool and ability to lower his cooldowns with each spell cast to drop an onslaught of magic. To some, it may look like slamming your keyboard, but perfecting the right spell rotations starts to feel like second nature. Playing Ryze properly makes you feel like the seasoned magus himself, effortlessly rotating through skills as you dominate those foolish enough to get close. 25. Azir: This Egyptian-themed god doesn’t do his own dirty work, but leaves it to his sand soldiers to assert control of the battlefield. Azir is all about gradually establishing presence, and he has a number of tools to control where the enemy can and can’t go. Between his ultimate’s ability to halt an initiation in its tracks, and being able to construct new turrets from the crumbled bases of old ones, Azir can assert a measure of influence few can match. Getting caught out without a plan means sudden death, but played slowly and methodically, Azir is a slowly advancing and unstoppable army. 24. Bard: Bard’s greatest strength comes from the wealth of choices he has. A mixture of support and a roaming lane ganker, his ability to pick up chimes around the map encourages him to occasionally leave his designated carry in order to help the whole team out. Bard’s tunnel is his biggest boon—the ability to create one-way passages through otherwise impassable terrain opens up a ton of interesting engages or escape opportunities, and his ultimate lets him stop a fight gone wrong and give your team time to reset. Bard changes the game on many levels just by playing him, and turns the support game into one of choices and activity rather than passive babysitting. 23. LeBlanc: The League’s deceiver, LeBlanc is an assassin who relies on trickery. At low health, she spawns a replicate of herself to fool enemies, and her dash can be recast to pop her back to the original location instantly. She can bind enemies and detonate marks of her Q, even replicating her own spells with her ultimate. LeBlanc always has a number of abilities and choices to make in any given situation, creating an assassin that is as much about individual playstyle as it is about optimal play. LeBlanc allows for emergent play and really engaging moments of player innovation, and so she’s one of the more exciting mids to master. 22. Twisted Fate: Twisted Fate is a strange amalgamation of Gambit from X-Men and an old Western poker player. His Pick-a-Card lets you rotate between three cards to throw at your enemies, offering you the choice between an area slow, a targeted stun or regenerating lost mana for more cards. His ultimate gives vision of the entire enemy team and lets you teleport across the map, opening up tons of offensive or defensive plays. Those who play Twisted Fate favor aggression, often recklessly so, but it’s the kind of aggression that’s impressive to watch and difficult to master. One wrong card pulled means the difference between a kill and a waste of time, and you have to juggle your card selection and targets while dodging hits, because TF can’t take many of them. A deceptively simple champion that opens up a ton of opportunity for early play and aggression. 21. Zed: There’s a sense of mastery that comes with playing so many mid lane assassins, as their need to perfectly execute in order to fulfill their role on the team has become their defining attribute. Zed embodies this, as one of the best in the class at instantly annihilating his target, but only if played intelligently and with skill. Being able to create and move between shadows that mirror his moves sounds like a huge deal, but managing your cooldowns and which shadow to jump to is key—one wrong jump has you sitting out like a sore thumb for the enemy team to clobber. Still, just watching two high-level Zed players face off is uniquely impressive. The way they use their skills and count cooldowns is impressive, and especially solo matchups show the amount of potential the champion has in creating unique states of play. 20. Kassadin: The former king of the mid lane, Kassadin has been a little forgotten as of late, but it’s hard to deny the unique role he’s always held. His ultimate is one of the biggest game-changers in League—the ability to blink (short-range teleport) around the map turns him from a slow, trodding bruiser into a tricky assassin. Knowing just how to dive in, do your damage and get back out for another rotation is key to playing Kassadin, and being able to hop walls and terrain forces you to be aware of the entire map for when openings pop up. As one of the few anti-magic mages, Kassadin continues to fulfill a unique role that few can match. 19. Teemo: What else is there to say about Teemo? Everyone knows him, and everyone hates him. The little critter plants explosive ‘shrooms all around the map, just waiting to kill you while you run back to base with only a fraction of your life left. He pokes and prods you with poison, then skitters off when you get close. He’s annoying as all hell, but there’s really no one else like him. Teemo is endearing, the way that you get a little fond of that dog that keeps tearing up your lawn. If that dog stopped, you’d be glad, but then a few weeks later you might sigh and think fondly of it. Teemo is like that, only at the end, you step on an explosive mushroom and die, cursing his name. Plus, he’s already a lot like a dog, in that most of his skins involve dressing him up in dumb outfits. Teemo, the Instagram puppy of League. 18. Elise: This spider queen might be one of the more formidable foes when it comes to jungling simply due to her number of abilities. While her three normal skills all do one thing when she’s a human, she can also transform into a spider for another set of devastating skills. Switching between the two forms for different tools and sources of damage is key to playing Elise, and makes her one of the more engaging junglers to play. Cocooning someone and then leaping up into your web, only to descend down on the victim and start mashing away at them with your pincers is not only fun, but downright terrifying. A few jungle ganks from an enemy Elise will likely instill you with a mild case of arachnophobia, but she’s still a great jungler that always keeps things interesting (and horrifying). 17. Yasuo: Yasuo is all about calmly observing and reacting to the enemies’ moves. Most of his skills are built around quick bouts of movement, and both his wind wall and his ultimate rely on reaction time more than most others. Playing Yasuo is a bit more challenging than most, but the reward is learning a nuanced, interesting mix of a mage and carry. Blocking massive skillshots with your wind wall is really satisfying, especially if it’s something like Ashe’s arrow or Jinx’s missile, and his ultimate rewards those who draft and play around Yasuo’s strengths. A niche pick at times, but one that is extremely and uniquely entertaining to play as and against. 16. Nidalee: Nidalee has been through many phases of her life. Originally a tanky bruiser for the top lane, she eventually became a staple of the mid lane for the power of her spears. Her current kit focuses on her ability to transform from a wild huntress into a prowling animal, and it feels like her most comprehensive and engaging kit yet. Marking enemies with your spears and then leaping after them makes you feel like you’re on the hunt, and while no one ability she has is as dangerous as her old spears, she can still output tremendous damage if played effectively. No champion plays quite like Nidalee, and it’s that unique blend of multiple skillsets and playstyles in one champion that makes her such an interesting part of League. 15. Ashe: The quintessential frost archer, Ashe is one of the oldest champions in League of Legends, but even through countless changes, patches and reworks, she still feels like one of the best carries to play. Her ability to launch volleys of arrows and kite enemies around, always keeping them just far enough away, became the blueprint for many marksmen to come, but Ashe’s ability to do it still feels unmatched. Her ultimate, a giant crystal arrow, brings it all together, allowing her to start a fight herself or stop an enemy team from getting the jump on your allies. She’s careful, precise, and quite dangerous in the right hands. Ashe continues to be both a brilliant “starter carry” and a fantastic champion to master, even at the highest levels. 14. Riven: Playing as Riven feels inherently different from playing as any other champion. With no mana and only cooldowns to worry about, her focus is on stringing together her abilities in interesting ways. Her Q gives her three short hops to work with, and she also has a close-range stun and dash to keep her mobility and presence high. Since using an ability empowers her next attack, you have to always be mindful that you’re dealing the most damage you can while still executing properly. She’s a challenging champion to learn, but rewards those willing to spend time mastering her abilities; a well-played Riven is truly intimidating, often able to crush her lane on pure skill alone. 13. Udyr: Udyr has no ultimate, which already sets him apart from 99 percent of this list. The master of the wild has four stances, or forms which he can move in and out of to enhance his abilities. This means that Udyr has a unique power spike and a much different playstyle from most others—he never casts “skills,” he just changes what his attacks do. Running around stunning foes in bear stance, then switching to turtle to soak up damage, followed by tiger for attack speed or phoenix for the area burn, Udyr is always active and attacking. He’s always fun to try new items or builds on, and his many stances give him plenty of ways to tackle any situation. 12. Leona: This tanky support might be one of the best around at getting in the enemy's’ face and being aggressive. Able to stun and slow with all of her abilities, each skill she uses leaves a gleam of light on her target, which allied champions can detonate for extra damage. Playing Leona means turning on your shield, erupting your Eclipse on as many foes as you can see and charging headfirst into the fray, a far cry from many other supports who prefer to keep their distance and wait it out. If you like getting aggressive while still supporting your teammates, there’s few others that do it like Leona. 11. Blitzcrank: I hate-love Blitzcrank. He’s great when you’re on his team, because his signature Rocket Fist can jet out and grab enemies, pulling them right into your team for a quick end. When he’s on the other team that happens to you, and you hate him for it. Either way, no one really catches people out like Blitz, able to instantly turn a patient back-and-forth into a full-on engage with one grab. He’s one of the biggest playmakers in League, changing the game fundamentally every time he’s picked. 10. Jinx: Of all the champion releases Riot Games has put out, few were as hyped-up or exciting as Jinx. A full-blown music video showcasing her crazy antics was the first introduction to her character, a punk-rock anarchist who loves guns and explosions. Her ability to switch between a minigun or rocket launcher as her weapon gives her versatility and depth, she can zone out offensive threats with her chattering-teeth traps, and her Ultra Mega Death Rocket is a glorious weapon of mass champion destruction. Jinx is pure insanity and fun to play, and shows how concept can sell a champion just as well as the kit. 9. Janna: This gathering storm of a support brings every tool you’d need to effectively back up your team. Able to create massive tornadoes that can disrupt foes, shield her teammates and give them a backwind in order to speed them up, Janna lets others shine while she floats in the back, deciding who to assist next. Each part of her kit rewards smart and opportunistic play, as well as enforces smart player choice in when to use her abilities. This is a support that rewards the patient helpers out there, and one of the better designed supports in any game around. 8. 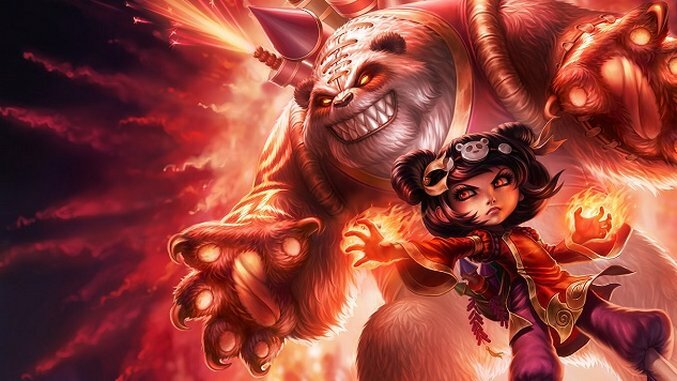 Annie: “Have you seen my bear Tibbers?” A mild mannered child with a tendency to light things on fire, her true power comes in turning her teddy bear Tibbers into a massive flaming beast that rips apart enemies. Annie’s kit benefits those who keep track of her passive, which makes her fifth ability stun those hit by it. The ultimate Annie moment is always landing a massive Tibbers summon on all five members of the opposing team, stunning them all in place and then burning them to a crisp. It’s one of the coolest ultimates and most unique champion designs in the game. 7. Jarvan IV: The fact that Jarvan always remains relevant in some form, through every patch and change, is a testament to his design. The interaction between his flag and lance, letting him dash through enemies knocking them up, is pure brilliance. His Cataclysm shows that some of the best ultimates are the true game-changers: locking his enemies inside a pit, where Jarvan and his team can freely strike them down, is just amazingly fun. The bearer of the Demacian standard has one of the best kits around, and leads to some really exciting (and sometimes hilarious) moments. 6. Orianna: Orianna is only one half of the kit, with the other part being her ball that she commands. Able to move around the lane, slow enemies, shield allies and reposition multiple foes at once, Orianna is all about careful play and zone control. Smart players know where the ball is in relation to Orianna at all times, and are able to move it around to slowly pinch their opponents in and wear them down. She isn’t quite a burst assassin, and she isn’t quite a sustained damage mage either—Orianna stands tall as a control mage, able to manipulate the flow of battle to her advantage, and the way she and her ball interact is one of the more interesting concepts in League. 5. Ahri: Based on the legend of the nine-tailed fox, Ahri is a temptress who lures her foes into a false sense of security before bursting them down. Her orbs and spirit fire make her dangerous at all ranges, and her alluring E makes foes helplessly chase after her, setting them up for the fall. Ahri’s ultimate lets her dash three times, damaging nearby enemies on each leap, further making her a mobile and damaging assassin. Conceptually, Ahri is interesting, but as a whole champion, she’s one of the most versatile and fun champions to play in the mid lane. 4. Ezreal: Ezreal is easily one of my favorite carries to play. Able to work as both a mage and marksman, his kit rewards those who play intelligently and keep foes at just the right distance. Constantly poking and prodding from the right range, Ezreal is hard to catch due to his short cooldown teleport, and can output damage consistently and repeatedly, making him one of the more fearsome “poke” champions. His fluid build paths, clever playstyle and synergistic abilities make him really unique. If only he’d stop telling me I belong in a museum. 3. Fizz: Fizz is one of the more annoying assassins to play against, due to his crushingly effective and fluid kit. His Playful/Trickster skill lets him hop in and out of engages, and his Chum the Waters summons a massive fish to chomp down on a single target, which makes it one of the coolest abilities in League. He’s mobile, fast, hard to catch and brutally effective. He’s fun as hell to play, annoying to play against, and one of the best concepts in League. 2. Lee Sin: The martial arts master has been a staple of the game since his induction, and learning to play Lee Sin is a sort-of rite of passage to being a high-level jungle player. Lee’s kit offers endless options for interesting plays, from kicking enemies around and dashing to them, to using his targeted dash on anything from champions to wards. He accidentally brought in an entirely new mechanic of “ward jumping,” something only Lee can do, and so opened up a number of new plays and opportunities in the game. Lee embodies the potential that single champions have in changing the meta as a whole, and so deserves his role as the staple jungler. 1. Thresh: In making this list, it was difficult to think of anyone but Thresh at the top. He’s always been a defining champion in the support role, and is one of the biggest playmakers in League. His hook that lets him lock people in place or close the distance with them gives him plenty of options, while his flay lets him interrupt tons of abilities in crazy clutch situations. Thresh’s lantern, though, really gives him the edge, letting him toss out a buoy for allies to grab onto. Once hooked, Thresh drags them to him, often saving them from harm’s way—or dragging an allied jungler into the fray for a massive play. Thresh could do literally zero damage, and still be an effective part of any team composition without being underpowered or broken. That’s the sign of a clever champion concept, one that easily stands the test of time through patches and reworks, and one of the most impactful and memorable champions in League of Legends. Our ranking of every League of Legends champion continues with this fifth and final installment. If you missed them, first read parts one, two and three and four. Here’s the conclusion of our rankings of every champion in League of Legends.